Haryana Public Service Commission (HPSC) released important notice regarding eligibility of HCS (Ex. Br.) & other Allied Services 2017. 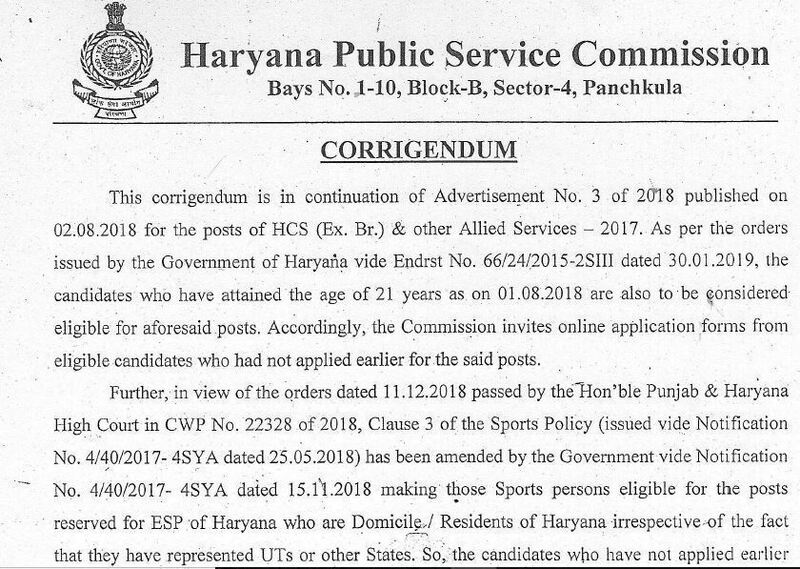 Haryana Public Service Commission (HPSC) released important notice for Advertisement No. 3 of 2018 published on 02.08.2018 for HCS (Ex. Br.) & other Allied Services 2017. As per the orders issued by the Government of Haryana vide Endrst No. 66/24(2015-2SIII dated 30.01.2019, the candidates who have attained the age of 21 years as. on 01.08.2018 are also to be eligible for aforesaid posts. Accordingly, the Commission invites online application, forms from eligible candidates who had not applied earlier for the said posts. The Haryana Public Service Commission(HPSC) re-invites online applications for recruitment to 166 posts of HCS (Ex. Br) &- other Allied Services. For more information log on to the official website of HPSC http://hpsc.gov.in or www.hpsconline.in. The candidates who had applied earlier against Advt No-3/2018 need not to apply again as their earlier application forms will be considered, if they fulfill all the eligibility conditions as per provision of above Advt No. 3/2018 (i.e. age will be determined as on 01.01.2018 & other eligibility regarding qualification etc will be determined as on 14.09.2018).